Starting from the convenient Ripon Racecourse which boasts fantastic facilities. From here the route starts by heading North following the River Ure, which provides a flattish first 15km to allow your legs to warm up. 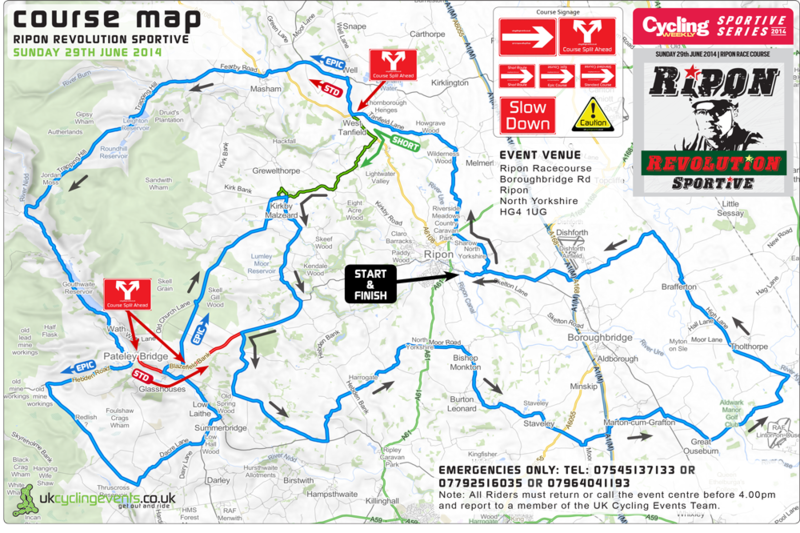 Then the route passes Masham and onto Leighton Reservoir, at which points things get a little more challenging… Your first of 4 quality climbs is here and your legs will burn as they climb up the 15km’s to the top of High Ash Moor. Your legs will be distracted though by the breath taking views, sense of wilderness and deserted roads! After a descent into the Village of Lofthouse, your first of up to 3 feedstations awaits. From here you have 10km of a slight downhill gradient as you follow the River Nidd to pass the spectacular Gouthwaite Reservoir. Legs recovered, it is time to test them again… it is the challenging climb of Greenhow. At the top a 15km decent awaits, offering plenty of recovery before the climb of Round Hill and the final major climb up to the enchanting Brimham Rocks. Good news… hard work done, you now have 60km where the general gradient is either flat or slightly down hill as you make your way east following and crossing the River Ouse and Ure. You will also pass over the old Aldwalk wooden toll bridge at Little Ouseburn. It is North East from here, back to Ripon Racecourse, where you will receive a well deserved medal! Post event refreshments and massages will also be waiting. There are 3 route to choose from, 102 miles, 77 miles, 65 miles.